Leverage financed with credit, such as that purchased on a margin account is very common in Forex. A margined account is a leverageable account in which Forex can be purchased for a combination of cash or collateral depending what your brokers will accept. The loan (leverage) in the margined account is collateralized by your initial margin (deposit), if the value of the trade (position) drops sufficiently, the broker will ask you to either put in more cash, or sell a portion of your position or even close your position. Margin rules may be regulated in some countries, but margin requirements and interest vary among broker/dealers so always check with the company you are dealing with to ensure you understand their policy. Up until this point you are probably wondering how a small investor can trade such large amounts of money (positions). The amount of leverage you use will depend on your broker and what you feel comfortable with. There was a time when it was difficult to find companies prepared to offer margined accounts but nowadays you can get leverage from a high as 1% with some brokers. This means you could control $100,000 with only $1,000. Typically the broker will have a minimum account size also known as account margin or initial margin e.g. $10,000. Once you have deposited your money you will then be able to trade. The broker will also stipulate how much they require per position (lot) traded. In the example above for every $1,000 you have you can take a lot of $100,000 so if you have $5,000 they may allow you to trade up to $500,00 of forex. The minimum security (Margin) for each lot will very from broker to broker. In the example above the broker required a one percent margin. This means that for every $100,000 traded the broker wanted $1,000 as security on the position. Margin call is also something that you will have to be aware of. If for any reason the broker thinks that your position is in danger e.g. you have a position of $100,000 with a margin of one percent ($1,000) and your losses are approaching your margin ($1,000). He will call you and either ask you to deposit more money, or close your position to limit your risk and his risk. If you are going to trade on a margin account it is imperative that you talk with your broker first to find out what their polices are on this type of accounts. Variation Margin is also very important. Variation margin is the amount of profit or loss your account is showing on open positions. Let’s say you have just deposited $10,000 with your broker. You take 5 lots of USD/JPY, which is $500,000. To secure this the broker needs $5,000 (1%). The trade goes bad and your losses equal $5001, your broker may do a margin call. The reason he may do a margin call is that even though you still have $4,999 in your account the broker needs that as security and allowing you to use it could endanger yourself and him. 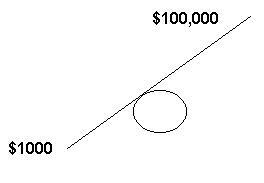 Another way to look at it is this, if you have an account of $10,000 and you have a 1 lot ($100,000) position. That’s $1,000 assuming a (1% margin) is no longer available for you to trade. The money still belongs to you but for the time you are margined the broker needs that as security. Another point of note is that some brokers may require a higher margin during the weekends. This may take the form of 1% margin during the week and if you intend to hold the position over the weekend it may rise to 2% or higher. Also in the example we have used a 1% margin. This is by no means standard. I have seen as high as 0.5% and many between 3%-5% margin. It all depends on your broker. There have been many discussions on the topic of margin and some argue that too much margin is dangerous. This is a point for the individual concerned. The important thing to remember as with all trading is that you thoroughly understand your broker’s policies on the subject and you are comfortable with and understand your risk.